Full package of tourist services in Pskov city. Discount Hotel Reservation. Airline tickets. Travel Reservations System. Accessories and travelware. Ancient Russian Pskov city. Travel Reservations. Russian. The total area of the Pskov region is about 55 300 sq. km., it is larger than that of Denmark or Switzerland. The Pskov Region is divided into twenty four administrative districts, each governed by its own administration. Pskov city is the regional center of economic and cultural activities. It has a similar role to that of a state capital in the U.S. Pskov has population of 210 000 people. 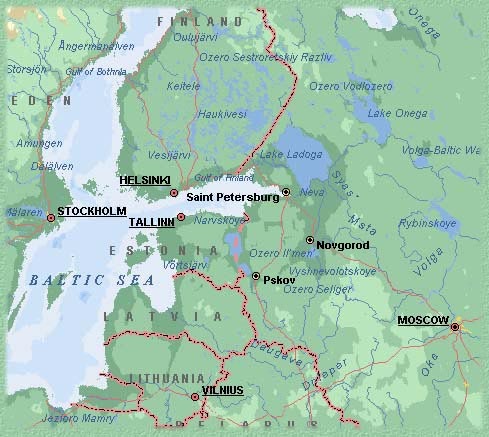 The distant to the Pskov is 4 hours from the cities of St. Petersburg and Tallinn (Estonia), and 12 hours (by train) from Moscow. The city has an airport, river port, railroad and a bus station. Pskov is one from the oldest cities in Russia. Pskov has celebrated its 1 100 year anniversary in 2003. 24 July, was - "St. Olga's Day" and Holy Liturgy in the Trinity Cathedral. Russia is a unique "giant planet" where two cultures - Eastern and Western - meet each other. The richest heritage of the old Russia continues to charm and surprise, while its great future potential has not yet been fully realized. The purpose of this publication is to help you discover and appreciate our cultural treasures. The area of the Pskov region is larger than Denmark, Netherlands, Switzerland, Armenia or Estonia. The length of the borders on the countries of the Commonwealth of Independent States and the Baltic Republics is 790 km. On the territory of the region there are large peat deposits, limestone for construction and cement, refractory and fusible clays, gypsum, construction, molding and glass sand, limestone tuf and supropels. Peat is one of the most abundant natural resources. The limestone in the Pskov area is a traditional material. In ancient times they used to build churches and fortress walls of limestone. At present the limestone is widely employed in the restoration of architectural monuments as well as in the production of road metal and construction lime. The clay is available for making ceramic goods, drain pipes and sewers, acidproof and heatproof articles and decorative tiles. Gypsum is used for the production of medical gypsum and plaster of Paris. Clear homogeneous quartz sand is used for the production if silicate bricks and laying and plastering mortars. In the Pskov region forests occupy 1,8 m hectares, that is 37 % cent of the territory. Territory of the Pskov region possesses significant recreational resources. The Pskov region is often called the land of lakes, there are over 3000 lakes on the territory. 37% of the area is occupied by forests abundant in berries and mushrooms, there are vast hunting grounds there. Unique places of Sebezhsky national park, lake area Blue Lakes in the Nevel district, Khilovo sanatorium and its healing mineral water and therapeutic muds, ecological cleanness and charming beauty of nature, all this provides favourable conditions for ecotourism and it might attract a significant number of tourists. A great amount of cultural and sport events held on the territory of the region may become the ground for organization of large festivals that can attract attention, and, as a consequence, tourists funds in the foreign market.